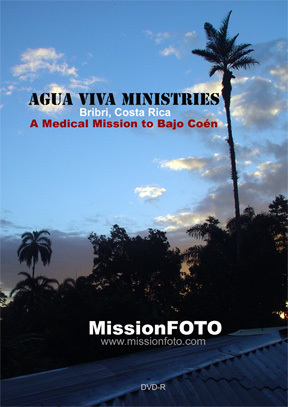 MissionFOTO journeyed into Costa Rica along the Coén River near the juncture of Panama and the Caribbean Sea for our first trip into the Talamanca Valley jungles with Agua Viva Ministries and its director, John Whited. While the trip from the small border town of Bribri to Bajo Coén is only 10 miles, the trip via pickup truck, dugout canoe and hiking required nearly 16 hours. We accompanied Dr. Dwight Adams of Kansas on the week long medical trip to the Bribri Indians. Bathing each morning in the cold river prepared us for an exhilarating day of recording the 200 plus smiles breaking forth from the folks being ministered to by John and Dr. Adams.